It's hard to think of something more relaxing than paddling through calm waters and listening to the sound of water as you glide. If you mix this experience with the fun of splashing into the water every once in a while, you got yourself the best choice for some weekend fun. But then, hunting for the best inflatable stand up paddle board can be tricky and challenging. There are so many options out there that you barely know what to choose. Whether you are new to this kind of activity or you already have some experience, the Tower Adventurer 2 Inflatable SUP might be the optimal choice for you. It's worth exploring the specifications of a paddle board before making a final decision, not to mention analyzing its pros and cons. Find out whether it is suitable for you before spending your money, hence the necessity of research. So, what should you expect from this model and what makes it so popular? Why Tower Adventurer 2 Inflatable SUP? Tower Paddle Boards is specialized in convenience, so this model is all about making your paddling experience more comfortable. It's an inflatable model, so it carries a series of benefits. Most importantly, storage and transportation will never be an issue anymore. Forget about renting a paddle board on the beach. If you choose to buy your own, don't even think about purchasing a professional roof rack or renting a trailer. Since this model is inflatable, you can roll it up in a backpack, fit the pump and paddle in, then hit the beach – pure like that. Storage is just as handy. Not everyone has a garage or a shed to store a large board. If you live in a flat, the storage problem is even more overwhelming. When rolled up, this board can go into a cabinet or your terrace with no issues at all. There are multiple reasons wherefore this unit is among the top 10 paddle boards on the market. One of them is the actual all-around profile. Paddle boards can be categorized by more criteria, and the type is one of them. Some of these categories include fishing, racing or yoga boards. Unless you're a professional, you don't need a specific board. Whether you want some fun, chill with your family or friends, an all-around board will tackle most of your problems. You can also use it for yoga or fishing if you feel like, yet it won't have any specialized features – not a problem at all. Furthermore, an all-around board is suitable for people of all skill levels. Even if this is the first time you try this sport, chances are you'll learn how to maneuver the board within the first session only. Sure, you'll get a few splashes, but that's what water sports are about. Apart from the actual fun and recreation, there are more health reasons to buy inflatable paddle board. Some people rely on it to exercise, while others recover after injuries. It's a low impact workout that can keep you in excellent condition. But the physical health is not everything, as paddling on a regular basis is also proven to reduce stress, improve sleep and relaxation. Now, what makes this inflatable SUP one of the top rated paddle boards out there and what features can you count on? Tower Paddle Boards doesn't fool around when it comes to performance. It's known for its durable paddle boards, but also for focusing on things that matter. Most models can be used out of the box without buying any extra equipment. When not sure how to choose a paddle board, rigidity is a must. 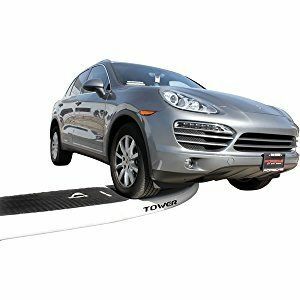 You want a model that can support your weight, but also a unit that will feel like a hard board. 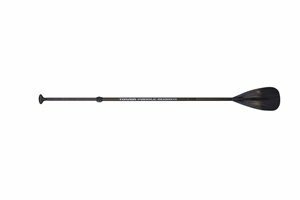 This superb SUP is made from military grade PVC. It's a rugged material that you usually find in extreme river rafts and boats. The construction is based on thousands of strands connected at the top deck and the bottom. When properly inflated, this structure feels like a solid board and can take up to 350 pounds in weight. That's the main recommendation for less experienced users. If you know what you're doing, you can maneuver it with more than that. The PVC is so sturdy that it can take lots of beating without facing any issues. That's a common problem with expensive hard boards. Bump into something hard, and they might scratch or crack. With an inflatable model, you won't see any dents. Although the package includes a repair kit too, chances are you'll never need it anyway. Click here if you are looking for other types of SUP. You don't expect to find too much versatility in a low-cost water board, yet this model ensures you gain as much as possible from your water experience. Simply put, this isn't just a basic paddle board, but a wide model that allows a kayak conversion. How? Easy! The paddle it comes with is made from 3 pieces – a stick and two blades. You can fit in one blade if you feel like paddling in a standing position, but you can also fit the second one if you want to turn the board into a kayak. Of course, it won't have tall sides like a professional kayak, but it will mostly work as a sit-on-top kayak. Other than that, you won't always ride in a standing position. Sometimes, you feel like sitting down and chilling while listening to the sound of water. Other times, you might want to sit on your belly and paddle with your arms. If you're new to this, you probably won't start in a standing position anyway, but on your knees. The comfortable soft top allows using the board in any position. It's not rough or hard, but the inflatable profile makes it feel soft and relaxing. You can go on for hours without feeling any discomfort. The more complete the package is, the better. 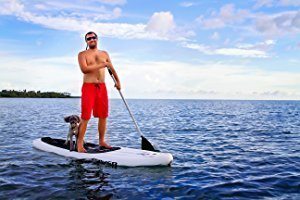 You don't want to buy the best inflatable stand up paddle board for beginners, only to realize that you have to purchase other accessories to use it. In fact, you'll be so excited when it comes that you'll want to use it right out of the box. Luckily, this model is based on convenience. Apart from the inflatable board, this model comes with a 3-piece paddle, a repair kit, and a pump. The paddle allows a basic conversion to a kayak, but it's also adjustable in length based on your height. It's made of fiberglass, so it's lightweight and won't cause too much soreness. The pump is manual. Take the board out of the box, fit the pump in and get to work. Put the paddle parts together, and you're ready to hit the water. However, the pump is manual, which means you'll need some exercise to inflate the board. If you're not used to physical activity, it'll be challenging. This is the reason wherefore plenty of people would save their energy for paddling and invest in an electric pump instead – not mandatory, but entirely up to you. 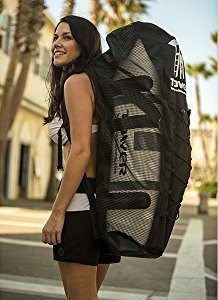 When compared to other similar models, Tower Adventurer 2 Inflatable SUP doesn't come with a carry bag. Given the low price, it's quite understandable. 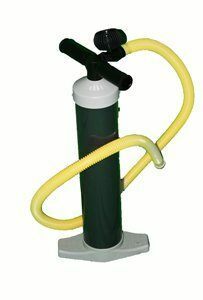 You can purchase a backpack specifically designed for it, which allows space for the pump and paddle as well. However, if you have a larger backpack around, you can just as well use it. The board weighs 26 pounds so that it might feel heavy at times, hence the necessity of a backpack with waist straps. Given the fact that it's not a specialized board, this model can be used for most related activities, from yoga to fishing. It has a standard length for this range, but it's slightly wider. In other words, it's more stable. Maneuvering it is simple at low speeds, yet there's a small drawback – it'll never be as fast as a racing paddle board. In the end, it's easy to tell what makes Tower Adventurer 2 Inflatable SUP one of the best inflatable stand up paddle board. Rated at 4.6 out of 5 stars, it brings in the features and capabilities of a hard board, but without the heavyweight, storage and transportation issues.